Is A Pet Tortoise A Good Idea? Lots of people think a pet tortoise would be fun. If you are one of them, here are some things to think about. A tortoise lives for a long time. Some tortoises have lived for about 200 years. A pet tortoise could live longer than you do. Do you want a pet that lives that long? There are small tortoises, large tortoises, and in-between-size tortoises. Will you have room for a tortoise? Will you be able to care for an adult tortoise? Be sure you find out how large a tortoise will be when it grows up before you decide to keep it as a pet. A tortoise pet will not want to cuddle. In fact, it may not want to have anything to do with you at all. In the wild, tortoises are solitary animals. Be especially careful about getting more than one tortoise. For example, two males may fight each other. A pet tortoise will need care from a vet who knows how to look after a reptile. Is your local vet a reptile specialist? Check the laws in your area. In some cases, it's illegal to own certain animals. It is illegal to import endangered animals in many countries. Tortoises are endangered. That means that only specialized breeders should breed and raise exotic tortoises. It's sad that many tortoises sold in chain stores are not healthy because they have been raised by people who do not know how to care for them. Still want a tortoise for a pet? Find out everything you can about the kind of tortoise you want. Be sure that you have the right kind of space for your tortoise. 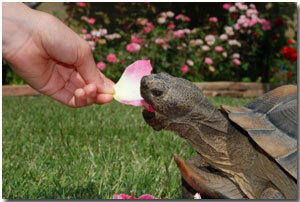 Check with your vet to be sure he or she can take care of your pet tortoise's health. Do a check on the breeder.